Patricia Cheng Terry paddles with Tim Haywood. It's raining again. After a glorious September and early October, the fog is rolling in and the days of peek-a-boo sunshine are back. For me, this means my running season is over, and my climbing is going mostly indoors. But there are still a few ways to enjoy Humboldt that do not include whining about the weather. Stand-up paddle boarding is my current favorite. I love being close to the water, controlling my speed as I glide quietly across the surface. I also love that the learning curve is gentle. Stand-up paddle boarding emerged in the 1950s as a hobby for Waikiki beach boys, men who made their living teaching surfing and canoeing to tourists. The beach boys stood on long boards and used outrigger paddles to reach distant surf break, and to maneuver through small waves during beginner surf lessons. Modern day paddle boarding was popularized in the 2000s by Laird Hamilton, Dave Kalama and other pro surfers in Hawaii. They were looking for a way to stay in shape when the surf was low, and the "retro" style of paddle boarding appealed to them. In the last few years, stand-up paddle boarding has made its way behind the redwood curtain, and the sport is perfectly suited for our waters. 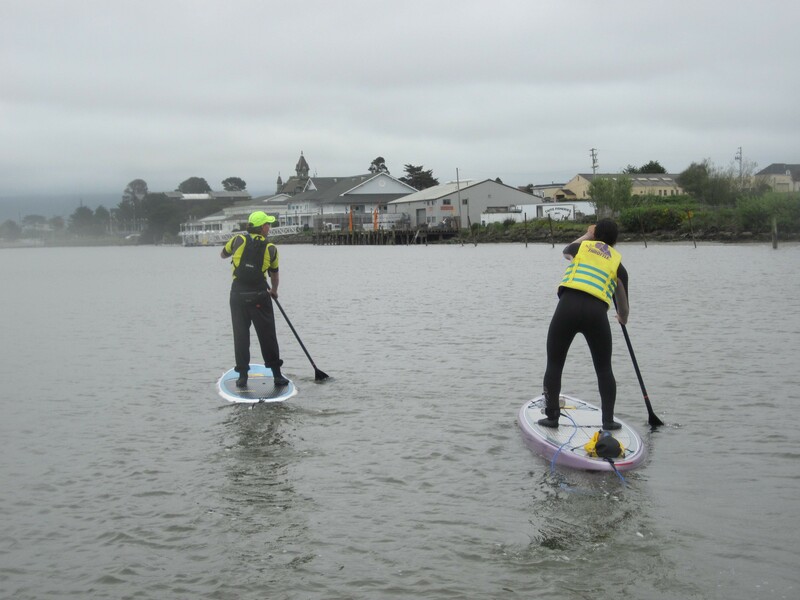 Stand-up paddle boarding is not a difficult sport to learn, and it's a fantastic way to explore the bays and lagoons of Humboldt. All you really need is a decent sense of balance in order to stand on the board. If you're lacking even in that department, you can always paddle from your knees and gradually work your way up to the "stand up" part. The paddling itself doesn't require much strength, just a willingness to sink into the hips and pull the long paddle through the water using not just your arms but the strength in your back and abdominal muscles. You can rent the necessary equipment (board, paddle, wet suit, life jacket) from local outfitters and put in from any of the public docks in Humboldt Bay or from the beaches of Trinidad Bay, Big Lagoon or Mad River Beach (to name a few). Below are brief profiles of my favorite spots. Each has its own unique character and sights, and offers relatively flat water for beginners. The easiest place to put in on the bay is from the Woodley Island Marina. The first dock (closest to the parking lot and the entrance to the marina) is for public access and offers the most convenient spot for unloading gear and starting your paddle. From the dock, you can paddle west around the tip of Woodley Island (in the direction of the giant fisherman statue) and then through the waters that separate Woodley and Indian islands. During the fall, these waters are full of seals, my personal favorite marine mammal. In the spring you can often spot baby seals napping on the beaches of both islands, waiting for their mothers to return from fishing. If you spot a seal, be sure to stay at least 100 feet away to keep from startling it. And don't be surprised if one or more seem to be following you. If you set out from the marina about an hour before high tide, the current will be with you as you paddle out to Indian island. If you take time to explore, you should be ready to return to the marina just as the tide is turning. It's possible to circumvent Indian Island or paddle through its sloughs, but save those adventures until you're familiar with both the tide tables and your paddle board skills. Until then, an out and back will afford you lots of fun wildlife views and a deep appreciation for the bay. For this trip, you can rent gear at Pacific Outfitters or book a lesson and guided trip from Tim Haywood at All Out SUP (www.alloutsup.com). Tim's trips and lessons include gear rental, except for wetsuits. Big Lagoon is my favorite water in Humboldt. During the summer, I like to run on the spit and then swim in the lagoon, where the waters are just warm enough to make for a non-frigid swimming experience. During the fall, you're better off on top of the water. Put in at the county boat ramp. Paddle straight out toward the end of the sand spit. The water is flat and relatively sheltered from wind. You can paddle the entire 3.5 miles to the end of the spit (7 miles round trip), or turn around at any point for a shorter loop. The water is crystal clear during the summer, and then increasingly brackish through the winter. At some point during the winter, the lagoon waters will breach the spit and drain out. Paddle this route while you can! If you're interested in doing more exploring in this area, you can also head up Maple Creek (under the bridge on the right). Depending on how soon you go, there should be enough water in the main channel to paddle about a half mile up this quiet, scenic creek. If you're very lucky, you'll even see some otters, my second favorite marine mammal. This is about a three-mile round trip. For this trip, you can rent gear or book lessons and guided trips from Marna Powell at Kayak Zaks (www.kayakzak.com). If these spots have piqued your interest, there is more exploring to be done. Trinidad Bay's waters are still relatively flat, but as you paddle out into the more open water from the beach, the stakes get higher. If you trust your balance, have a good wetsuit and are prepared to swim a bit, it's time to take the bay. If you're interested in smaller water but more wildlife, the Hookton Slough is your best bet. The boat ramp at the slough is a gentle put-in that sets you up to explore the south bay. But be sure to check your tide tables lest you get thoroughly stuck in the mud.